Now here’s a wonderful find. I don’t think I’d have been drawn to these if it weren’t for the really good photo that accompanied the recipe in ‘The Modern Vegetarian’ by Maria Ella. Basically the chips were arranged in a kind of Jenga tower and they looked very impressive. As you can see I didn’t copy that presentation! 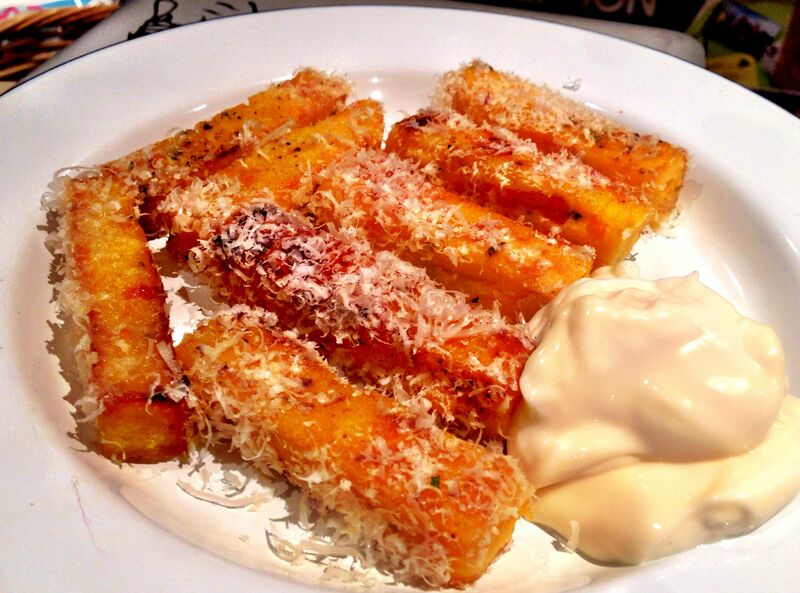 I’ve decided that keeping a packet of polenta in the cupboard is a good thing! I’ve only ever made one thing with polenta – Polenta and Sage Pizza – but this is far cooler. I think I could even convince my six year old daughter to eat these – she’d never know they weren’t potatoes. Making these is pretty easy – but not necessarily quick. 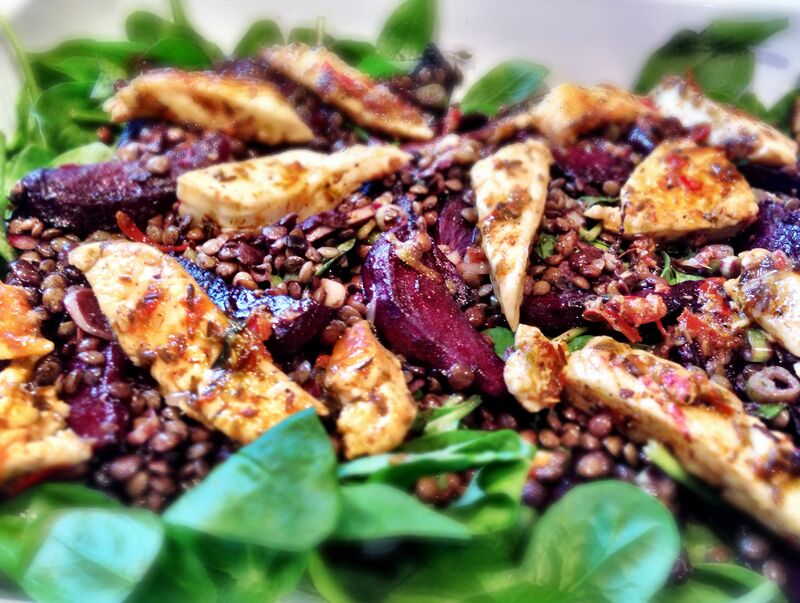 There’s not a lot of cooking time – just a lot of waiting time for things to cool. Firstly you dice some butternut squash very small and boil it with some rosemary. 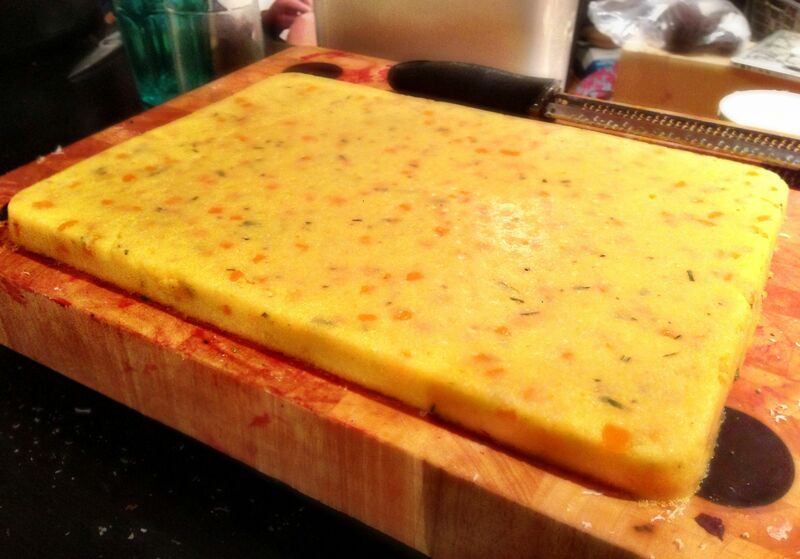 Then you add polenta – and when it thickens you pour it out into a greased tray (or one lined with parchment) and allow it to cool. You really need to season polenta well as it is broadly tasteless. I pressed a load of sea salt and pepper into the top of my slab. When it is cool enough to put it in the fridge, do so – or do what I did and whack it in the freezer. As you all know by now I eat at stupid o’clock most evenings – we ate these past 10pm again – so the freezer was the quickest way to get this nice and solid. 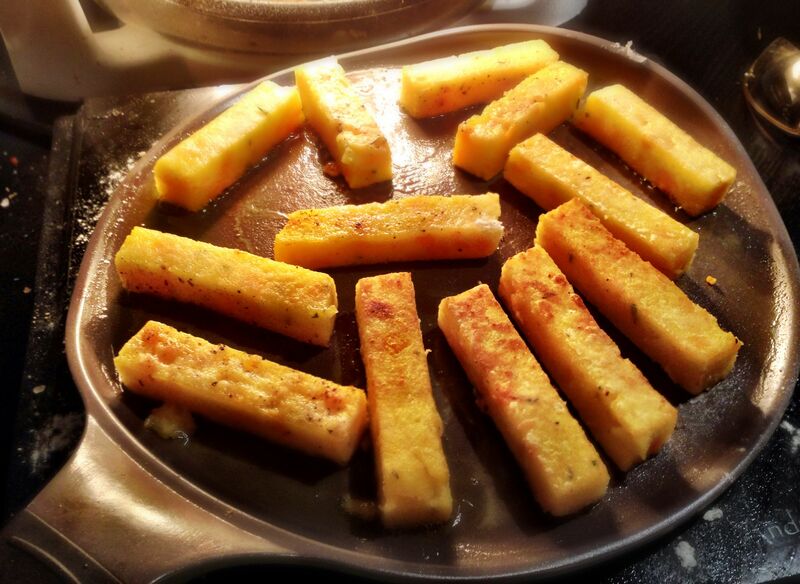 Cut it into chip sized errr chips, dust them lightly in plain flour and fry them. I did mine in two different ways – in a halogen oven – and in a frying pan. It’s pretty hard to take a picture of the excitement inside a halogen oven – so here’s a picture of a frying pan! I have to say the crispier chips came from the halogen oven. And they stayed hotter for a lot longer. Once they are nice and golden and done, take them out and roll them in some very finely grated parmesan cheese. If you have one of those fancy microplanes like I do this really does the trick beautifully. I served Freya’s chips with mayonnaise and my own with ketchup. I think mayonnaise was the better option! The book suggests swapping out the butternut squash for either peas or sweetcorn. Both of which I plan to try. I have to say I couldn’t taste the butternut squash, nor the rosemary. I think it would be better not to add the rosemary to the butternut squash when you are boiling it – I just think it ruins the herbs. It might be better to add it in when you are stirring the polenta – just to keep it fresher! I really liked these – I could eat a bowl of these anytime – even if they are really just a side. The slab was big – so we had these again the next day as a ‘starter’ while I cooked up our next dinner!